Finished look when installed in models to see if the original engine are also the connections at the top and a large and small flange is present. Motor with a large and a small flange about 9 mm and 6 mm. 12V 35000U/Min 235g/cm! fits in most cars with this engine mounts, came to me before, but may have to be some cars fly by, or Pro-X Slotit polished up a bit on the motor housing. This engine impresses with its great performance, the figures speak for themselves, for upgrading of many vehicles in 1:32 scale. 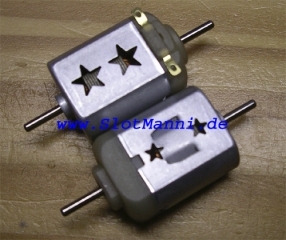 However, a motor already needs a decent power supply and the right gear to show his full potential!